To celebrate Ami's return from her stint as Darkury, Usagi, Rei, Luna and Makoto have thrown a welcome back party for her! They all sing karaoke, giggle and have a great time. Elsewhere, Minako and Artemis are in a limo and discussing the current Sailor Soldier events. Minako seems worried about a new idol that has appeared and tells Artemis that when she met her she sensed something and suspects she could possibly be with the enemy. At that moment the new idol is in the middle of a photo shoot and stares evilly towards the viewer. The next day at Usagi's house, Usagi has a fight with her brother over who's more popular, Minako or Mio the new idol. Shingo is convinced that Mio is more popular because she's on more commercials than Minako but Usagi is convinced that Minako is a better idol and tells him that she's loyal to her first idol. Usagi continues this conversation with her friends on her way to school and she eventually convinces them to continue being Minako fans. Ironically when they arrive at home room, they find that the new idol, Mio has transferred to their school and is now a fellow classmate! The whole class, including Miss Haruna, crowds around Mio and asks for photographs and autographs. Usagi tries to stop her friends but they tell her a real idol is better than an imaginary one anyday. In PE, the girls are all playing a game of Volleyball with Usagi on one team and Mio on the other. Mio shows some impressive game skills and beats Usagi's team something awful. To make matters worse when everyone is looking at a ball she just slammed she walks up to Usagi and kicks her in the shin. Mio fakes an apology but Ami sees the whole thing and notices Mio's content smile at Usagi's pain. In England, Mamoru is woken up by an English friend with an American accent who over articulates everything he says. Mamoru gets up to join him for breakfast but is surprised to see the form of Zoicite in his room offering to help him stay on his path. Mamoru ignores him and joins his friend. At Crown Karaoke, Luna rocks up in her human form and tries to get into the karaoke room. Motoki stops her and asks her where her parents are and tells her that she's too young to enter by herself. Makoto soon arrives though and tells Motoki that Luna's with her. Seeing Makoto, Motoki lets Luna in. Later on, Rei arrives at the karaoke room and finds that Luna has given Ami and Makoto both the task of catching pieces of paper with chopsticks to help them awaken their Sailor Soldier powers. Rei walks up and catches one on her first try. 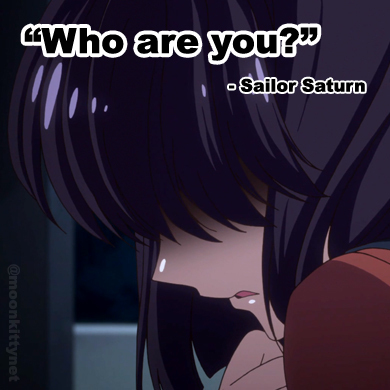 Usagi meanwhile has run into Mio on her way home who seemingly upset, asks Usagi why she doesn't like her. Usagi tells her that that's not true and Mio quickly takes this opportunity to announce that they're now good friends! The two hang out and eat ice cream and all that. Suddenly though a Youma appears! Usagi grabs Mio, who's screaming hysterically, and drags her away to safety. Unfortunately, Mio hurts her arm during on of the Youma's attacks. Usagi hides her under some stairs and runs away to transform into Sailor Moon and defeat the Youma. 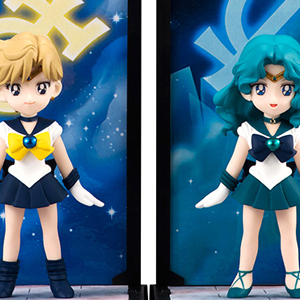 Once transformed, Sailor Moon finds Sailor Mercury, Jupiter, Mars and Luna battling the Youma. Sailor Mercury uses her star attack for the first time but finds that it has no effect. Sailor Mars then tries her star attack as well but it also has no effect on the Youma. The attempt to perform the powerful Moonlight Attractive Attack with just the four of them but the Youma blasts them and sends Sailor Mercury's star tambourine flying. Instinctively, Sailor Mercury raises her hands and releases a beam of bubbles that stops it mid-air. Sailor Luna then catches it in her Moon Wand which has transformed into a net and tells Sailor Mercury not to forget what she just learnt. She tosses the star tambourine to Sailor Mercury and then attacks the Youma with a new powerful attack, Luna Sucre Candy which knocks the Youma over. The four Sailor Soldiers then manage to perform Moonlight Attractive Attack which destroys the Youma. The next day at school, Usagi arrives at home room to find that the whole class with the exception of Ami and Naru has turned against her! Turns out Mio has told them all what happened the day before, how she was hurt and then Usagi left her and ran away. Mio is up to something. This episode gave us our first look at the interesting and superbly acted character, Mio! Sailor Mercury used her star tambourine basic star attack for the first time in this episode. Sailor Mars also used her star attack for the first time in this episode. It's interesting how each Sailor Soldier performs their star attacks differently from each other. They're not just simple energy attacks people! Not wanting to be left behind in the attack department, Sailor Luna used a new attack in this episode entitled, Luna Sucre Candy! Mamoru's English friend in this episode is a prime example of how the English language is used on Japanese television, i.e. dumbed down and over articulated to the point where it sounds so unnatural that they may as well have gotten a Japanese speaker to say the lines. Despite learning English at school in Japan, the average Japanese person cannot communicate in an English conversation do to most of their learning being text based and being taught by a non native teacher. Most people find understanding a native English speaker almost impossible unless they speak in a strong American accent and at half their normal speaking speed. Because of this Japanese TV shows and movies use a form of English that is far from natural but will be easier for the average Japanese person to understand. Even then the odds of the average viewer understanding it is so small that almost always, Japanese subtitles are used or in the case of some movies, have the English speaking scenes dubbed into Japanese for the theatrical release and then replace the audio on the DVD release (Godzilla Final Wars, which contains a huge amount of English is a good example of this).